Synaptics Incorporated SYNA recently announced that TCL Corporation has adopted its AudioSmart far-field voice (FFV) technology for television sets that have Alexa built in, the smart speaker from Amazon AMZN. The new televisions from TCL will be exhibited at IFA 2018. Apart from being enhanced with AudioSmart FFV digital signal processors (DSPs), the television sets can be controlled by customers via voice commands due to the in-built smart speaker. A surge in demand for smart homes, smart devices as well as voice-enabled products is aiding Consumer IoT products of Synaptics. Revenues from this segment increased 319% on a year-over-year basis in fourth-quarter fiscal 2018. The company’s strengthening footprint in this high growth segment is expected to boost investors’ confidence in the stock going ahead. 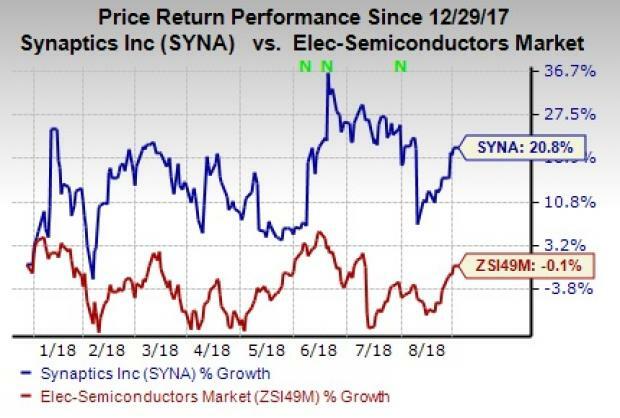 Synaptics stock has gained 20.8% year to date against the 0.1% decline of the industry it belongs to. Synaptics is trying to tap all the growth prospects. Most recently, the company introduced solutions for virtual reality (VR) head-mounted displays. Synaptics expects to better cater to the augmented reality (AR) and virtual reality (VR) requirements of gaming, movies as well as medical industries. However, weakness in the smartphone market is hurting mobile products revenues. Mobile products contribute the majority of the revenues. The company expects the weakness to continue in the second half of the calendar year as well. Revenues in the last-reported quarter declined approximately 8.9% from the year-ago quarter to $388.5 million and were within the guided range of $370-$410 million. The figure lagged the Zacks Consensus Estimate of $395 million. Nevertheless, management is looking to restructuring the optical finger print business of the mobile segment. Additionally, solid partnerships with the likes of Microsoft MSFT and Advanced Micro Devices bode well for this Zacks Rank #3 (Hold) stock.